Investing in recreational property - Welcome to NIHO Land & Cattle Company Ltd.
British Columbia is a desirable province to invest in land, because unlike other provinces, it doesn't have foreign restrictions on recreational land purchases. We continue to see high demand for recreational properties, from small lots to waterfront parcels to large ranches. British Columbia is big, but there’s actually a limited amount of land available. Only 5 per cent of land is privately owned. Ninety-four per cent is provincial Crown land and almost 2 per cent is covered by fresh water. The provincial government is not selling Crown land and hasn’t for many years. 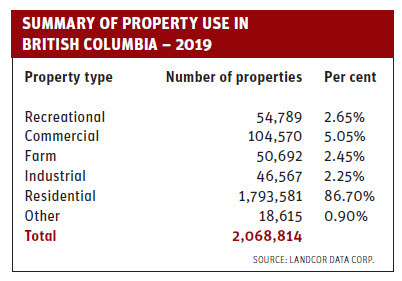 So, while there’s a total of 2,068,814 taxable properties, this covers all private properties including residential, commercial and industrial. Only 2.65 per cent of private properties are recreational. It’s no wonder, therefore, that demand remains high. There are some things to contemplate if you are considering purchasing land for subdividing into smaller lots. You need to consider that the number of restrictions and approval processes (roads, water, utilities, relics, etc.) can be lengthy and expensive in most of the province, making it a long, drawn-out process for developing. Therefore, it’s often easier and less expensive to purchase smaller lots in existing subdivisions where the approvals and infrastructure are already in place. What’s your reason for wanting to purchase recreational property? There are many different types of buyers. Recreational buyer – purchases a small lot to park an RV and either build or fix up a cabin with the intention to use as recreational in the short term but sell for a profit. Where to look: Okanagan, Kootenays or Omineca. Unique buyer – This is someone who purchases B.C. islands, ocean waterfront and private lakes. These properties offer different climates – mild weather like the Sunshine Coast, or other properties farther north that provide a full four seasons. These buyers want waterfront properties for recreational use and good fishing. Where to look: Sunshine Coast, Vancouver Island and the North Coast. Apprehensive buyer – This land buyer thinks the world financial order will collapse and they believe that B.C. is one of the safest places in the world. They invest in a piece of property for a “safe place, just in case.” This is an investment to sell at a profit. Where to look: Kootenays, Omineca, North Coast. Dream buyer – This investor has been watching cowboy movies sincechildhood and is fascinated with owning a ranch and in a financial position to do so. Where to look: Thompson Okanagan, Cariboo, Peace River. Weekend cowboy buyer – These buyers are seeking a property where they can purchase or build a log home and have cattle and horses. This property would require a caretaker to run it. The owners leave Metro Vancouver Friday night for the two-and-half-a-hour drive to the Merritt area. They get their boots dirty. Sunday night they head back to the coast leaving the property and livestock for the caretaker to attend to. Where to look: Thompson Okanagan, Fraser Valley. Dedicated buyer – This hard-core rancher purchases a ranch and operates it as a ranch with the intention to expand. It is completely run by a head foreman. This purchaser may get only a small return for investment, in some cases no return: it’s a long-term investment. Where to look: Omineca, Cariboo, Peace River. Private island buyer – This investor wants privacy, and is therefore looking to purchase a private island with access only by boat, small plane or helicopter. Where to look: Vancouver Island, North Coast, Lakes District (Omineca). Renowned buyers – These investors are influential and famous. They are looking to purchase a retreat accessible by boat, plane or helicopter. They build mansions and private golf courses and use them as a relaxing getaway. Where to look: You’ll never hear about these purchases – discretion is key. No matter your personal reason for investing in land, if you have the right advice and planning you can own a recreational property that is perfect and profitable for you.